We’re closing in on the big day! In order to make sure we have the funds to get Miles to college in Wisconsin, I’m having a raffle! 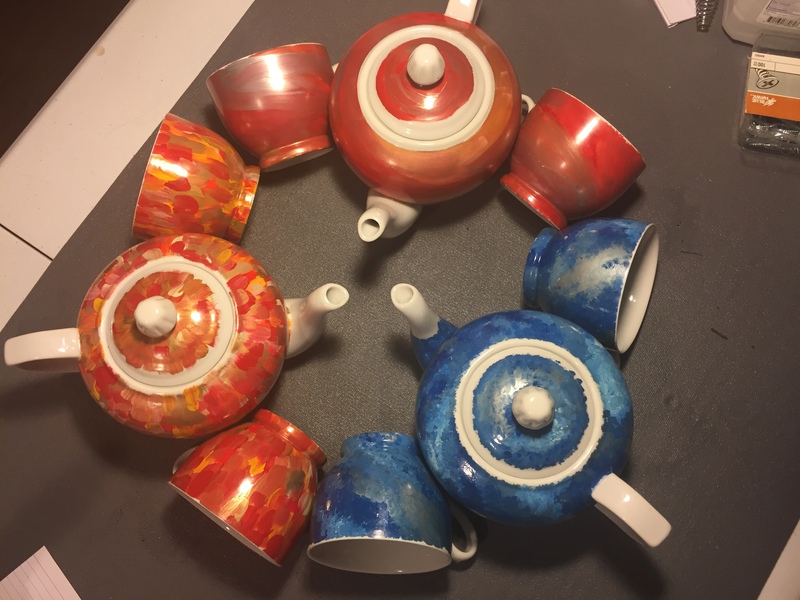 Everyone who has or does contribute to the big move is entered into a random drawing to win one of my hand-painted tea sets! One lucky winner is going to get one of these sets after we get back from Wisconsin. The drawing will be held on Monday, July 24th, 2017, and the number of entries will be determined ultimately by how many people contribute how much. Will it be $5 per entry? $10? We’ll find out! If you don’t want some sweet hand-painted gorgeousness, please make a note in your contribution that you’re just in it for the charity. OOOOoooooor, if you don’t want to risk the rush, I’ll let two of these sets go for $75 each. The set is the teapot and two matching teacups. Another oooooooor, if you would rather have your own sweet mug, I still have a few hand-painted stand-alone pieces left at $40 a piece. I’ve got a couple of zombie-themed ones, “Stand Alone” (a pretty blue minimalist silhouette 12-oz mug), a sea turtle big mug… message me to let me know if you’d rather do that. Your purchase price will not qualify you for the raffle, though it will contribute to the trip. Everything over what we spend for the trip itself will go to helping get Miles set up in his new digs in Madison, Wisconsin, where he starts college this fall for Political Science.